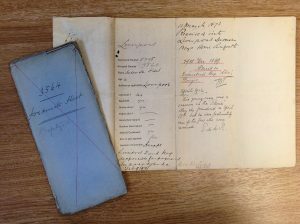 In commemoration of the 100th anniversary of the Battle of the Somme we have a post written by one of our Archivists, Helena Hilton, that reflects on the life and death of a former ‘Waifs and Strays’ lad who fell in this corner of France. Twenty thousand dead on the first day, the worst day in the history of the British Army; eighteen weeks of slaughter that left over a million men killed or wounded on the two sides of the line; all for a scant few miles’ advance (Google Maps calculates that one can cover the whole distance advanced, at its widest extent, in sixteen minutes). The Battle of the Somme has seared itself onto the national memory as emblematic of the First World War in all its horror. But sheer numbers can deaden the impact of the story and sometimes to make it real it is better to concentrate on an individual story, one of the names on a war memorial, to stand as an emblem of all the many others. As we mark the 100th anniversary of the Battle of the Somme, we focus on one of those names carved in stone, a child who was in the care of The Waifs and Strays Society and ended his life in that corner of Picardy. Sadly many of the Society’s ‘old boys’ were killed or injured on the First World War battlefields, but thanks to the efforts of Martin Bashforth we know a bit more than usual about one of them, John Francis Cuthbert Bashforth (who was known as Frank). Despite sharing a surname Martin is not related to Frank, but his curiosity was piqued by seeing his name on a memorial and he set about investigating his story. It is remarkable how much can be assembled from the public record, and our enquiry service at The Children’s Society played a part in fleshing out the picture by providing a summary of Frank’s case file. (This, of course, is a demonstration of the power of records and the value of keeping archives.) As a result of Martin’s work piecing together various sources we now know about the entirety of Frank’s life: his article setting out his research and sources can be read in full here. Frank’s background was slightly out of the usual for applicants to The Waifs and Strays Society. His parents, Amy Barwis and John Bashforth, were from different social classes and they married against the wishes of Amy’s middle class father. Amy was the daughter of a well to do clergyman, Revd William Cuthbert Barwis, who at the time of her marriage was the vicar of St John the Evangelist, Hoylandswaine, South Yorkshire. John Bashforth was the son of a nail maker and had worked as a miner and as a labourer at a local ironworks. They had to run away to Sheffield to marry in July 1879, such was the opposition of William Barwis: he felt the shock so keenly that he moved to another church as a curate. The young couple returned to Hoylandswaine and had five children. Frank was the youngest, born on 5 February 1889. Tragedy precipitated the application to The Waifs and Strays Society. In November 1897 when the family was living in Headingley, Leeds, Amy died of a heart attack. Life would have been extremely difficult for John: becoming a full time father for any length of time was not an option for him in those pre Welfare State days, and provision would have to be made for the children. Frank was only eight when his mother died, and a few months afterwards, in March 1898 he entered the Society’s Bede Home, Wakefield. The application form, which was completed by his godmother Frances Annie Booker, revealed continuing tension following his parents’ socially unequal marriage. She suggested Amy’s ill health was in part due to lack of food “as the father of the boy drinks and is a good for nothing man. The mother was a gentlewoman, the daughter of the Reverend Cuthbert Barwis, for some time Vicar of Hoylandswaine, Penistone. Owing to his daughter marrying such a man he gave up the living.” Miss Booker promised to pay 5 shillings a week towards Frank’s maintenance. Shortly after arriving at the Bede Home Frank became an orphan: John Bashforth died of pneumonia in April 1898. Frank remained in the care of The Waifs and Strays Society until September 1902. He had gained a scholarship to Wakefield Grammar School in September 1901 and the following year his godmother took over responsibility for him. It was unusual for children in the Homes to continue their education beyond the usual school leaving age, and perhaps this indicates that Frank was seen as being of a higher social class with greater aspirations. The school archives record that he remained there until July 1907 when he left to take up a post with the Bank of England in London. Martin Bashforth has managed to construct a picture of Frank’s time in London using the limited sources available. It appears that alongside his employment at the Bank his strong religious beliefs drove him to work with the poor. His elder brother was a curate in a deprived part of the city. 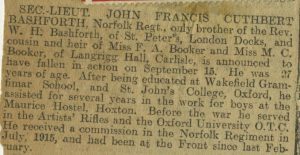 Frank found time to go to night classes and in 1912 he left London for St John’s College, Oxford where he studied theology, gaining a degree in 1915. He apparently intended, in due course, to become a clergyman, but since 1909 he had belonged to the Territorial Army and once his studies were completed and the War was underway he applied for a commission in the Regular Army. Frank was sent to France on 4 February 1916 as a Second Lieutenant in the 9th Battalion, the Norfolk Regiment. He features in letters written by a colleague, Lieutenant Cecil Upcher, who survived the War and left his personal records to the Royal Norfolk Regimental Museum, and it is these together with the battalion war diary, that have helped Martin flesh out Frank’s time on the Western Front. At the beginning of August 1916 the battalion was moved to the Somme Front. On 14 September they moved into the front line trenches. Frank was killed the following day during an attack on a German strongpoint known as the Quadrilateral. His body was recovered from the battlefield and personal possessions returned to his family; however his final resting place is not known and his name is recorded on the Thiepval Memorial to the Missing of the Somme. Frank was also remembered by other institutions including The Waifs and Strays Society. On 10 October 1916 the Secretary of the Ripon-Wakefield Branch of the Society, Lieutenant Colonel Beresford-Peirse sent a newspaper cutting about Frank’s death to the supporter magazine “Our Waifs and Strays”. In his letter he recalled that Frank was at the Bede Home “where he had a great influence for the good.” His family circumstances had been sad, as both his parents had died, but he had overcome these difficult beginnings and had worked hard to rise from them while doing his best for others. Lieutenant Colonel Beresford-Peirse was well acquainted with his history since leaving the Bede Home. The Society liked to keep in touch with the children it had helped, tracing their achievements and in some sad cases like this one adding their names to the Roll of Honour recording those who died in their country’s service. One name on a war memorial; one life snuffed out with all its potential. The work that Frank would have done as a clergyman never happened. Multiply it by thousands and we have an idea of the seismic impact of the Somme, one hundred years ago. 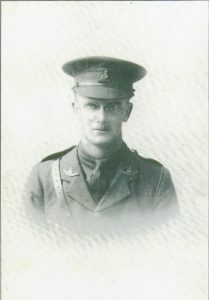 2nd Lieutenant John Francis Cuthbert Bashforth was killed in action on 15 September 1916 while serving with the 9th Norfolk Regiment. The sketch above, made by his comrade Lieutenant Cecil Upcher, is the only known image of him to have survived 1. The circumstances of his short life were such that contacts with his family, certainly on his paternal side, were attenuated, leaving little in the way of memories. He moved from place to place forming no local roots, other than briefly at the various institutions through which he passed. Any personal mementoes found their way to his older married sister and her family and, though treasured for a while, seem now to have been lost. There is no surviving photograph of him, either in civilian life or in his officer’s uniform. Creating an image of JFC has to be achieved by carefully assembling what is in the public record and that is remarkably rich 2. He was born 5 February 1889 in the village of Hoylandswaine, the fifth and last child of William Bashforth and Amy (née Barwis) 3. Hoylandswaine was then and remains a small community in south west Yorkshire, a few miles from Barnsley. In 1891 the total population was only 648 people in 136 houses and the population was in decline. Most of the local people were employed on farms or in nearby coal mines and iron works, though the village had for centuries been a centre of the nail making trade and more recently linen weaving. JFC’s father William Bashforth married Amy Barwis in the parish church at Sheffield on 7 July 1879, witnessed by his younger brother Amos and by Sarah Markham, who signed with her mark. William was 24 and Amy was 28. The addresses they gave were 6 West Street and 18 West Street in Sheffield respectively. Explaining why they chose to get married in Sheffield in this way and not in Hoylandswaine where Amy’s father was the vicar, forms a story in itself and requires background about each of their families. William Bashforth was one of ten surviving children from the family of John Bashforth, nail maker, and his wife Eliza Hawksworth (married in 1849) 4. Like his older brothers, William first went to work in one of the local coal mines. At the time of his marriage in 1879 he was described as a labourer. When the couple returned to Hoylandswaine after the marriage, William worked as a labourer in a local iron works. This was a distinctively working-class family of long-standing in the local community. Records of baptisms, marriages and burials stretch back to the late seventeenth century. The family of Amy Barwis provided a complete contrast 5. Her father, William Cuthbert Barwis, was born in Kilkenny in Ireland. His father was a land agent there for a prominent aristocrat, the Marquis of Ormonde. The Barwis family was extensive in Cumberland where William Barwis inherited Langrigg Hall, the family seat for his particular branch of the family. William was curate at the local church, Christ Church 7. Unfortunately, Mary died in 1852 when the family lived in Hunslet 8. William moved away and in 1861 was living at Church Street in Chipping Norton, accompanied by his daughter Amy, his mother, a niece and two servants. He was curate in the local church 9. The family continued to have connections with the Oxford area where his mother had been born. William Barwis married a second time to Ellen Sarah Tuckwell at Headington in 1869 10. That year he was given the incumbency at the brand new church of St John the Evangelist at Hoylandswaine. The church had been built partly with the generosity of the Spencer-Stanhope family of nearby Cannon Hall, in whose gift the incumbency was. In 1871 William appeared in the local census in the Vicarage House aged 46, with his wife aged 34 and daughter Amy aged 20. Once again they were assisted by two servants 11. The post of vicar attracted an annual stipend of £65. It was while living close by each other in Hoylandswaine that William Bashforth and Amy Barwis met and fell in love. But their runaway marriage, clearly meeting the disapproval of Amy’s father, caused a local scandal. The Reverend Barwis was relatively well-off, having sold Langrigg Hall in 1876 to some relatives by marriage. He would have had much higher hopes for Amy than a local labourer. The marriage was such a shock that he left the post of vicar at Hoylandswaine and took a step down the church hierarchy to become curate at the parish church in Romanby near Northallerton 12. Meanwhile, William and Amy returned to live in Hoylandswaine, where they raised their family. William Bashforth was born in Hoylandswaine and baptised at Silkstone parish church on 8 April 1855. His father was a nail maker living at Mustard Hill in Hoylandswaine. When he was old enough, William followed his older brother Christopher into the local pit (probably at Dodworth Colliery, which was closed after flooding in 1879) and later joined his younger brother Amos as a labourer in a local ironworks (probably at Cammell & Co, at Stocksbridge). Amy Barwis was the first and only child of the Reverend William Cuthbert Barwis and his first wife Mary. She was born 16 October 1850 in Leeds and baptised at St Peter’s church on 30 October. She was about eighteen years of age when the family arrived in Hoylandswaine, where the Reverend Barwis became the first vicar of the new church of St John the Evangelist. At that time William Bashforth would have been a boy of only fourteen, probably just started work at the pit. As he grew older William took a fancy to this older girl from such a prominent and wealthy family and in time the feelings were reciprocated. In 1879, when the couple ran away to Sheffield to be married, defying the opposition of Amy’s father, William was quite likely ‘between jobs’ following the pit closure at Dodworth. They lived at separate lodgings while in Sheffield before they married on 7 July 1879 at the parish church (now the Sheffield Cathedral) 13. They must have returned fairly quickly to Hoylandswaine, as they were living there when their first child, Ellen Musgreave Bashforth, was born in 1880 14. In 1881 they lodged at Heely Inn in Hoylandswaine and William worked as an iron works labourer, as he had been when his first child was born 15. Four more children followed, all born in Hoylandswaine: William Hoghton in 1881 16, Mary Katherine in 1883 17, Daisy Barwis in 1885 18 and John Francis Cuthbert on 5 February 1889 19. While raising these four children, William earned his living in Hoylandswaine as a grocer. William was trying to improve his position in the community, but it cannot have been too successful. When the couple appeared in the 1891 Census, they had moved to 78 King’s Road, Headingley in Leeds and William worked as a gardener. All the children except for JFC were at school. Headingley was a relatively prosperous suburb at the time, as Leeds began to expand to accommodate a growing population. On the face of it, William seems to have finally succeeded in his new occupation and continued for several more years as a gardener, working in horticulture rather than as a domestic servant 20. Tragedy came on 21 November 1897 at 78 King’s Road, when Amy was found dead aged only 47. There was a coroner’s inquest and the report stated that she had died of a heart attack (syncope) arising from general debility. There is no explanation as to the underlying cause beyond that. She was buried in Leeds 21. The oldest child, Ellen, was sixteen at the time and JFC, the youngest child, was only eight. Amy’s death hit William very hard and left him apparently unable to cope, both with the loss of Amy and the problem of how to raise five children without her at his side. He shortly returned to Hoylandswaine where he also died, of acute pneumonia, on 23 April 1898. In the short time between Amy’s death, leaving Leeds and his own death, he made what provision he could for his children. The results of those efforts can be found by tracing each of them in the 1901 Census. Ellen Musgreave Bashforth was incorrectly recorded as ‘Rushforth’ and was boarding with Joe Watts at Lower Norcross in Cawthorne (near Barnsley), aged 20. She was an assistant teacher in the National School in Cawthorne, where her future husband Benjamin Walter Swift also lived. William Hoghton Bashforth aged 19 was employed as a shorthand clerk and boarding at 25 Holderness Place in Leeds. Mary Katherine Bashforth aged 17 was a fancy cushion maker, lodging at 84 Kings Road, Leeds, not far from the former family home. Daisy Barwis Bashforth aged 15 worked as a stock keeper for a Leeds book publisher and lodged with her cousin Albert Bashforth and his wife Alice at 8 Bellbrook Grove in Leeds. Each of the four older children had found work and started their own life journeys, assisted by various relatives and motivated by a degree of education encouraged by their late mother. Things were not so easy for JFC, aged only 12. He was one of the inmates at the Bede Home for Waifs and Strays in College Grove Road, Wakefield, where he had been since March 1898, shortly after the death of his father. The Bede Home was set up by the Waifs and Strays Society (later the Children’s Society) in 1893. It was described at the time as ‘a large old fashioned house with a lively garden and a large paddock where the boys can play’. At first the building was rented, catering for 17 boys, but was bought and extended to make room for 20 boys in 1897, with further improvements to the accommodation following. It was described as having ‘a nice large, cheerful dining hall with a large dormitory above’. An old stable was altered in 1898 to create a playroom in the ground floor area to create a space for the boys in wet weather. It does not sound a particularly unpleasant place for JFC to arrive at the age of nine, despite the unfortunate circumstances. The details of his arrival have been archived and provide a great deal more background to the circumstances leading to it. Application was made to the Waifs and Strays Society on 14 March 1898 when the family were still living at 78 Kings Road, Leeds. JFC was a pupil at Queen’s Road Board School in Leeds and All Hallows Sunday School. The form was completed by Miss Booker 23 of 14 Bardwell Road, Oxford – she was JFC’s godmother – and supported by the Reverend FSK Gregson of All Hallows, Leeds, along with a statement from Miss Ellen Briggs, who had been a Nurse to the Barwis family when they lived in Leeds and Chipping Norton 24. [For some years after her service with the family, Ellen Briggs was a teacher in Manchester and at the time of these events she was a draper and outfitter in Leeds and had probably been close again to Amy Bashforth, who lived nearby, and through her with the rest of the family 25]. JFC was admitted to the Home in Wakefield on 17 March 1898. He remained there until 18 September 1902, by which time he was 14, when he was apparently removed by Miss Booker and sent to Wakefield Grammar School (though the records of the latter tell a slightly different story). JFC joined the school aged 12 on 19 September 1901, a year earlier than first indicated and a letter in the Bede Home files indicates that he gained a scholarship – which suggests that he was an excellent pupil, having until then attended the Cathedral School, Wakefield. Responsibility passed from the Governors of Bede House to Miss Booker – first of Bardwell Road, Oxford and later of Langrigg Hall in Cumberland. JFC remained at the school until July 1907 when he left to take up a post with the Bank of England in London. There are very few records from which we might trace JFC’s life after school. There are some letters to the Bede Home and the Grammar School following JFC’s death that provide some clues. Coupled with items from surviving army service papers it is possible to reconstruct something of JFC’s adult life. He went to London in 1907 and lived at Ingram House on Stockwell Road in Lambeth at the time of the 1911 Census, described as aged 22 and working as a bank clerk. Ingram House was opened in 1905 as a residential club for young men. There were 208 bedrooms in a building arranged in the shape of a St Andrew’s cross with various club rooms and leisure facilities. It was the fore-runner of the Lambeth YMCA. As well as employment at the Bank of England, Frank became involved like his brother working with the London poor in accordance with his strong religious beliefs. William Hoghton Bashforth was a curate in the docklands area and a member of the Guild of All Souls. Frank may have begun working with his brother and then made his own way to help with the Christian Social Union’s Maurice Hostel in Hoxton. The CSU was a high church Anglican movement focussing on mission work in the slum areas and otherwise among the poor. In 1909 Frank joined the relatively new Territorial Army. He signed up in the 28th London Regiment, the Artists’ Rifles, in which he trained and served as a private soldier. He remained with them until April 1912, when he resigned to leave London and go up to Oxford. During his time in London, Frank went to night classes to complete his matriculation. Combined with his Christian Social Union work this qualified him for St John’s College to study Theology where he gained a Third Class degree in 1915. The likelihood of an intention to join the priesthood was very high given this record, the history of his grandfather, his brother’s profession and his early years in Christian orientated institutions. While at Oxford he was also active in the Debating Society 27. 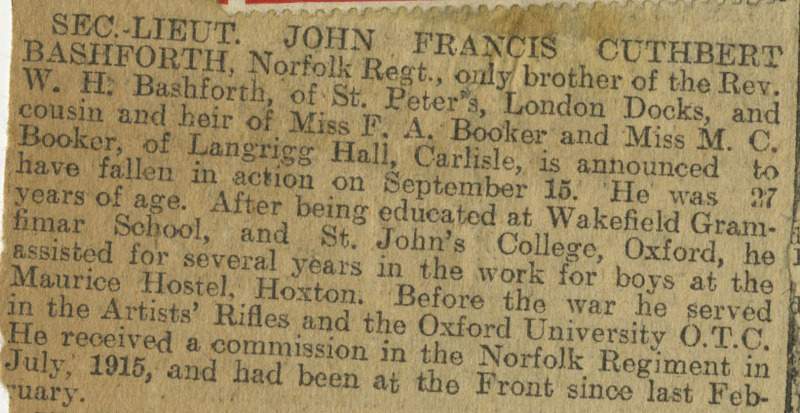 With the War in progress during his final year, Frank joined the Officer Training Corps at Oxford in January 1915. As soon as his studies were completed, he applied for a commission in the Regular Army. 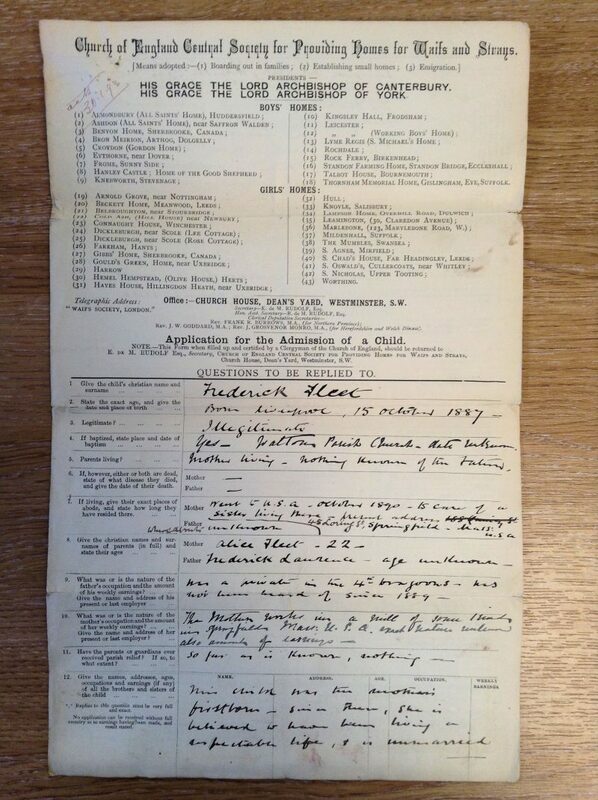 Frank applied to the Army on 5 June 1915. On the form he explained that he wished to serve as an officer in the Infantry, that he was not able to ride and that he wore glasses at all times, owing to strain through long sight. He gave his brother’s address and name as next of kin. William had by then taken up residence at Langrigg Hall in Cumberland with his maiden aunts, Frances and Mabel Booker 29. Frank’s own address was 26 Wellington Square, Oxford. The application was approved by Captain N Whatley of the University of Oxford, 9 June 1915. On 16 June he was granted the rank of Temporary Second Lieutenant in the 10th Norfolk Regiment. He was instructed to attend classes at The School of Instruction, St Mary’s Home, Sea Road in Felixstowe on 26 June between 2pm and 4 pm. The 10th Battalion was the Reserve Training Battalion of the Norfolk Regiment. Joining at the same time were WAR Bartleman 30, WD Ferguson 31 (both from London) and GJ Garnham from Norwich 32. Frank’s appointment was recorded in the London Gazette on 22 June 1915. There are only the slightest records of his army service surviving. Having completed his training Frank was sent to France on 4 February 1916 and this is the date that appears on his medal index card. The war diary of the 9th Battalion, the Norfolk Regiment 33, records that he arrived with the battalion on 13 February along with 2 Lt F Wright and Lt RA Jones. At the time the battalion had just completed a tour in the trenches at St Jean on the Ypres Front. Almost instantly he was with the men back in the trenches from 17-21 February before the battalion moved back for a short rest at Poperinghe. Apart from the sparse references in army records, the main source of information about Frank’s short time with the 9th Norfolk Regiment are the letters and sketches of Lt Cecil Upcher, a young man from Norwich who survived the war and left his personal records to the Regimental Museum. For several weeks the two men shared bunk space in various dugouts on the Ypres Front while serving with B Company. Combining Upcher’s writing with the battalion war diary it is possible to create a brief picture of Frank Bashforth’s time on the Western Front. On 30 April, while the battalion were dug in on the Canal Bank at Ypres, Upcher described how they had got sick of tinned meat so he and Bashforth opened a tin of peaches which they proceeded to consume. They decided to finish the tin as it said on the outside that they would go bad if left open. Towards the end of May, Bashforth was replaced by 2 Lt Jones and went off on leave. He returned on 4 June and Upcher’s letter of the following day described his ordeal. “He left here or rather the neighbourhood at 3 to 4 am by train arriving Boulogne midday, no boat till the evening owing to the tides or something and they got into Victoria 11.45 pm. If they had arrived half an hour later they would have probably got an extra day. This apparently they grant you if you arrive (at) Victoria 12 o’clock. It will be rather tragic if I get back as late as that.” It is to be presumed that Bashforth went to visit his aunts and brother in Cumberland. On 2 August 1916, the battalion was moved to the Somme Front, based largely in Mailly-Maillet Wood, while experiencing spells in the front line trenches nearby. A great deal of the time the men were involved in various working parties or in recovering bodies and salvage from No Man’s Land. There are no mentions of Bashforth by Upcher during this period, so they may have been separated for different duties. On 21 August 1916, Bashforth attended a Court Martial. He may have been called to take part in the panel, or he may have been asked to provide information about the man or event involved. The battalion war diary does not explain. Towards the end of the month the battalion were at Flesselles, where they were involved in ‘practising the Attack’. Something was definitely in the air and the 9th Norfolk Regiment was intended to be involved with the rest of 71st Brigade. On 1 September all the officers were watching their comrades from the Suffolk Regiment practising. A few days later the battalion set off via Mericourt L’Abbé to an area known as the Sandpits. This was a point half way between the towns of Albert and Bray, just south of the road. They were in tents and bivouacs. The men were spared duties on Sunday 10 September, apart from church parade. On 11 September they were moved into trenches at Trônes Wood where they had to sleep in shell holes. Next day some officers went on reconnoitre while the men tried to improve the living quarters. On 13 September they came under shell fire and three officers were wounded, one of whom died later. On 14 September the 9th Norfolk Regiment was moved forward into the front line trenches where they arrived at 10 pm to suffer an uncomfortable night before the next day’s actions. During the preceding fortnight, Allied forces had been trying to punch their way through a series of German strong points on the Somme Front. The 20th Division had taken Guillemont at the beginning of the month and since then others had progressed slowly and at great cost to take Ginchy and some of the surrounding woods, villages and countryside. The target for the 6th Division on 15 September was Morval and in its path lay the German strongpoint known as the Quadrilateral. For the first time the infantry assault was to be assisted by tanks 34. The attack was to be made by the 9th Norfolk Regiment, to the right of the 1st Leicester Regiment, each with a front of about 250 yards. They lined up in a sunken road behind the main trenches, which were manned by battalions of the Suffolk Regiment and the Sherwood Foresters. As they waited to attack at 5.50 am, the tanks moved forward. There were three supporting the 6th Division, of which two broke down, while the third tank (in front of the Norfolks) was badly shot up by German machine gun fire and lost its bearings. Accounts vary as to what exactly then happened. One version states that the unsighted tank began firing into a trench packed with the waiting Norfolks until Lieutenant Crosse leapt out to wave the tank away 35. Another version states that “its periscope was shot away, its peep-holes blinded, was riddled with armour-piercing bullets, and had to come back without achieving anything” 36. Whether or not the Norfolk Regiment had already suffered ‘friendly fire’ casualties, the tragedy was that a 200 yard gap in front of the battalion had been left unscathed by artillery so that the barbed wire (which should have been crushed by the tank) was still in place. Despite that, the Norfolk men still went over the top to attack the German lines at the Quadrilateral. Any artillery barrage on the German trenches had by then passed over and they attacked up a slope into withering fire. Amazingly, Major Bradshaw and about 40 men reached as far as the wire by 11.45 am and attempted to dig in. The rest of the battalion who had survived were scattered in shell holes behind. They were ordered to try to work round the flanks of the Quadrilateral to allow reserves to make a direct assault. The manoeuvre was unsuccessful and the Norfolk Regiment was withdrawn at midnight 37. As the 14th Durham Light Infantry arrived from the reserves, they discovered the trenches ‘full of dead and wounded Norfolks and Suffolks’. They helped recover the wounded in pitch darkness while clearing the trenches and improving the position 38. The casualties were shocking: 431 other ranks in all 39. Of these 169 men had died that day 40. Five officers were dead: Captain WT De Caux, Captain EJ Jephson, Lieutenant JL Goddard, Lieutenant WJ Phelps (initially listed as missing) and 2nd Lieutenant JFC Bashforth. Among thirteen wounded officers was the battalion commander, Lieutenant Colonel Bradshaw. 2nd Lieutenant Cumberland, one of the former dugout comrades of Bashforth and Upcher, was also wounded. As the full casualty lists indicate, this was something of an attempt at comforting understatement. The battalion had been badly mauled and was the victim of a failed experiment. In the days that followed, many of the bodies were recovered from the battlefield, including that of Frank Bashforth. As a result, some of his personal possessions were returned to his family: 11s 6d in cash, 1 wrist watch, 1 gold ring, 1 bead rosary. News of his death was slow to get back: the Field Services Casualty Form was dated 6 October 1916, reporting him ‘killed in action’ and his place of burial ‘not yet reported’. In the circumstances prevailing, it would have been difficult for the battalion to attend to burials, though they will have tried before being pulled out of the line and it may have been left to others. In any case the battlefield would be fought over again and subject to frequent artillery bombardment. Equally, any identification would have been removed from the body before the War Graves Commission people could arrive and sort things out. Frank Bashforth has no known grave and is recorded, along with his fellow officers and men from that day, on the Thiepval Memorial to the Missing of the Somme. News did get back to Frank’s brother William sooner than the official form. A telegram was sent on 20 September to Langrigg Hall: ‘Regret to inform you that 2 Lt JFC Bashforth 9 Norfolk Regt was killed in action 15/9/16. The Army Council expresses their sympathy.’ William responded the next day, thanking the Army Council for their sympathy and asking that ‘if any further details come in relating to the last history of my brother I shall be grateful if they can be made known to me’. The Army Council suggested on 26 September that he contact the officer commanding 9th Norfolk Regiment. Execution of Frank’s will was conducted through Hazel and Baines of 58 Cornmarket Street, Oxford and mainly comprised the handling of financial matters. After the settlement of any accounts, the total amount sent to Rev Bashforth was £75 16s 4d, most of which was back pay. The few personal effects were sent to him by Major CE Goddard from Wembley. Reverend Bashforth completed a form asking the War Office to send any scroll, plaque and medals to his sister Mrs B Swift of ‘Elmira’, 10 Springwell Lane, Balby, near Doncaster 41. The medals were despatched on 21 September 1922. The Reverend William Bashforth did not himself survive much longer. He suffered from a duodenal ulcer and went to a hospital in Edinburgh for an operation. Unfortunately, he died of a heart attack brought on by the effects of the operation on 27 March 1917. With him was his aunt Frances Annie Booker42. He was only 35 years old. JFC Bashforth has several places where his name has been recorded. Apart from the Thiepval Memorial, he is also listed on memorials at Wakefield Grammar School and St John’s College, Oxford. Each of these institutions also recorded him in various printed Rolls of Honour and to that extent he is not forgotten. That the Lieutenant Colonel had noticed the boy’s name amidst many other such notices and that he was well-informed of some aspects of his life since he left the Home, gives some indication that JFC had made an impression even at this early stage of his life – partly due to his circumstances (which may not have been too unusual among the Bede Home boys) and partly due to his personality. We have the first indication that JFC was known as ‘Frank’ to those who knew him well and, as was the case with many of those who bear the Bashforth name, was also known colloquially as ‘Bashy’. Perhaps the most unusual memorial, if that is what it might be called, appeared many years later. Together, probably during holiday periods visiting Langrigg Hall in Cumberland, Frank and his brother William conducted detailed research into the family history of the Barwis family (though not the paternal Bashforth side). The results of their research were passed to another researcher, Alec McDonald by the Misses Booker, who remained tenants of Langrigg Hall at least into the late 1930s. McDonald wrote up their notes and published them in the journal, The Transactions of the Cumberland and Westmorland Archaeological Society for 1937. The original notes were then passed to the nephew of Frank and William, the Reverend Frank B Swift, who added to the research and published two further papers in the same journal in 1949 and 1951. He commented that: ‘It was the wish of Lieutenant Bashforth to produce as ample a history as possible of this family and he succeeded in collecting much information before he was killed in action in 1916. His brother, The Rev WH Bashforth, who had helped, died soon afterwards in 1917’. Frank Swift was thus able to complete his uncle’s wishes. It has remained to this author to research the Bashforth side of the family to complete the picture and place 2nd Lt JFC Bashforth in his full context, to make this available to others who share the Bashforth name or are more directly related, to the successors of the institutions that had such a profound influence on JFC’s upbringing and to the Museum of the Norfolk Regiment in Norwich. 2 I use the initials JFC throughout most of this article, though in later life he was known as Frank. 12 There is a plaque in Romanby church fixed to the organ that reads: “To the glory of God and in loving memory of the Revd William Cuthbert Barwis MA for 10 years curate of this parish who died February 20th 1889 aged 64 years”. He served alongside the Reverend David Jacob assisting the vicar, Reverend Charles Caffin. 13 Marriage certificate: their addresses were both in West Street, Sheffield, with William at number 6 and Amy at number 18. 22 My thanks to the Records and Archive Centre of the Children’s Society for information about the Bede Home and the circumstances of JFC Bashforth’s time there. 23 Frances Annie Booker and her sister Mabel C Booker were nieces of the Reverend William Barwis through his married sister Sarah Jane Booker. 27 Biographical information supplied by St John’s College, Oxford. 29 Langrigg Hall had been a source of dispute between WC Barwis and Charles Frederick Booker, the father of Frances and Mabel in a case at Chancery in 1868 (TNA: C 16/475 Booker v Gutch etc alia). WC Barwis sold it in 1876 and this seems to have settled the issue. 31 Became Lieutenant and survived the war. 33 The battalion was part of 71st Infantry Brigade, 6th Division, along with 9th Suffolk Regiment, 1st Leicestershire Regiment and 2nd Sherwood Foresters. Did not Lived on her own means. 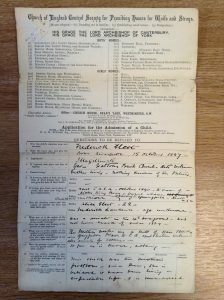 Another in the series of our blogs, written by one of our volunteers, Rod Cooper, that takes a look at The Children’s Society Archive’s children’s case files – in particular the case file of Frederick Fleet, who was most famously known as one of the lookouts on SS Titanic on the evening of 14/15 April 1912. The following is an account of the early years of Frederick Fleet during the period of his care under the auspices of Church of England Central Society for Providing Homes for Waifs and Strays (The Children’s Society). Born on 10 October 1887, the illegitimate son of Alice Fleet and Frederick Laurence – parents of whom he would have, respectively, little or no contact – Frederick Fleet was little more than two years old when, in December 1899, he was placed into the care of the Liverpool Foundling Hospital. He would remain there for three years. During his time at the Hospital it appears that his mother did – though somewhat irregularly – contribute small payments towards his upkeep and maintain a regular correspondence with the Hospital’s matron. The documents retained in The Children’s Society’s Archive also indicate that Alice Fleet may have intended to continue making contributions on her son’s behalf in the future, and wished to maintain her claim on him and eventually provide him with a home. Regardless of these intentions, however, the bond between mother and child was seriously weakened – if not severed for good – when she departed Liverpool for the USA in October 1890, and sought a better life with a sister living in Springfield, Massachusetts. Frederick remained at the Liverpool Foundling Hospital for three years, during which time the Hospital encountered its own problems relating to inadequate funds and the prospect of closure. In respect of Frederick – and as an alternative to his direct referral to the local workhouse – this resulted in the submission of an application to the Church of England Central Society for Providing Homes for Waifs and Strays – as The Children’s Society was then known – and his transfer in March 1893 to the Liverpool Diocesan Boys Home, Seaforth. He was to stay at Seaforth and the care of the The Society until shortly after his twelfth birthday in November 1889. Seaforth’s formal title was Elm Lodge Home for Boys. The home was officially opened in March 1893, and it is likely that Frederick would have been among the initial cohort of residents. The home catered for up to 30 boys, typically aged between 7 and 14 years of age. Whereas there is little specific documentary information relating to Frederick’s time at Elm Lodge, in general terms the home would have provided him with a relatively stable and safe environment to grow up in. He would have been involved in the daily tasks of maintaining the home – such as working in the kitchen garden and cleaning dormitories – whilst being able to attend the local school and participate in local community events involving the Church. The limited information there is regarding Frederick suggests that he was at times a troublesome child and an occasional cause for concern to his mentors. Of course, care has to be taken in the interpretation of such sources and the temptation to draw general conclusions should be avoided, but what is clear – and most certainly pertinent with regard to Frederick’s future – is that his behaviour did impact on the choices and decisions made on his behalf by those individuals responsible for his placement immediately upon leaving Elm Lodge. Frederick’s position – and future – became a concern to the The Society in late November 1899, shortly after his twelfth birthday. And in the period of little more than a week, between 23 and 30 November, there was a flurry of correspondence regarding his future. Indeed, at this particular time, his specific circumstances are not exactly clear, though there is evidence to suggest that he was no longer resident at Elm Lodge and had been placed in the temporary care of the “Shelter” for the Liverpool Society for the Prevention of Cruelty to Children. The homes to which Beatrice Lockett referred were all run by The Society, and the latter two were ‘industrial homes’ providing agricultural training for their residents; a significant number of which were relocated to Canada upon leaving. It would not do at all we think for F[rederick]. Fleet to go to Tattenhall, [words illeg.] we have just sent a boy there who gave us a great deal of trouble at Seaforth at the same time as F[rederick]. Fleet did. Many thanks though for all the trouble you have taken in the matter. My husband has written to the Commander of the ship “Clio” at Menai Straits, Bangor[,] to see if we can get Freddy on that ship. We do not wish him to be on the “Indefatigable” here[?] on account of the days off & he would hang about Seaforth when he had holidays. He is at present at the “Shelter” for the L’[iver]pool [Society for the] Prevention of Cruelty to Children, & we are naturally anxious to get him placed elsewhere soon. Just what motivated Mrs Lockett and her colleagues to take the action they did, especially when arrangements for Frederick’s removal to Tattenhall were seemingly settled, is unknown. What is clear, however, is that their decision was made with some urgency and in a manner that effectively discouraged opposition. 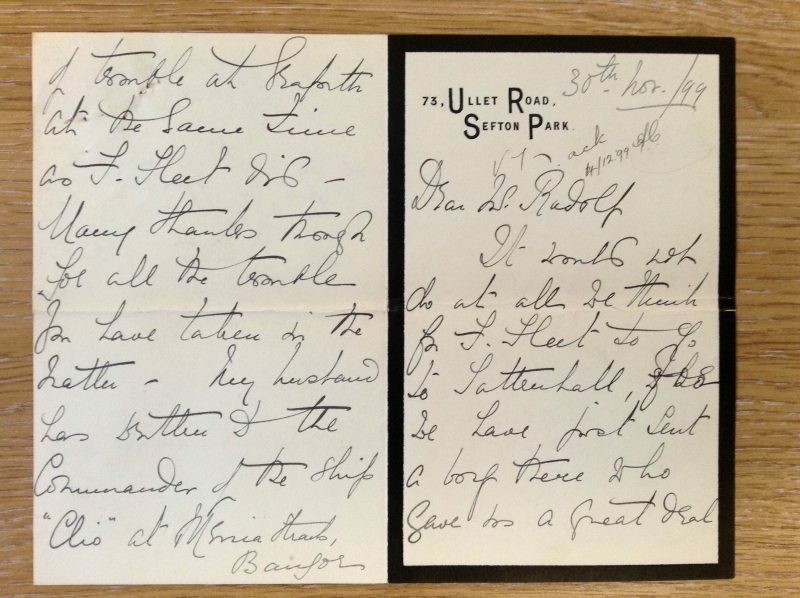 It is tempting to speculate too, given Adela Joyce’s prior knowledge of Frederick’s behaviour at Seaforth, that there was correspondence between the Seaforth and Tattenhall Home Committees considering the suitability of placing Frederick at Tattenhall. While this remains speculation it is entirely clear that the decision made by Mrs Lockett and her colleagues was to set Frederick’s future on a previously unanticipated course. In a matter of a few short days then, the efforts and involvement of a small number of people, established Frederick’s path towards a life as a seaman and to be name forever associated with the sinking of SS Titanic. A former Royal Navy corvette, the Clio was an Industrial School Ship moored off Bangor, in the Menai Straits. During the nineteenth century there were numerous such institutions, and they were created to train young boys in seamanship and to prepare them for a life at sea, whether in the merchant marine or Royal Navy. Whilst some of these ships were of a ‘reformatory’ nature, this was not the case with Clio, and many of the 260 boys on board, aged between 12 and 16, were orphans from homes such as Frederick’s in Liverpool. Whilst undoubtedly receiving valuable training and skills in seamanship, by all accounts life on board was harsh and uncompromising. Beatings and bullying were rife, and the boys were subject to arbitrary and random discipline. Having left the care of Elm Lodge Home for Boys 1899, little is known of Frederick’s life for the four or so years he spent on the Clio. However, there are two letters in his case file retained by The Children’s Society Archive that clearly indicate that he remained in touch with at least one member of the Home Committee at Elm Lodge; and one who may also have been responsible for securing Frederick’s future with the White Star Line. Here is the case of one of our most difficult boys, I almost despaired of him at one time – I had him trained on board the Clio & have never lost sight of him, & had him up to see me[? ], he is lookout man on the White Star Sir Oceanica  [and] grown a fine young fellow, 27  years of age – a teetotaller. & he told me he had got £36 in the Bank. Thank God is all I say. Kindly return the letter. Whilst accounts of and details of the sinking of SS Titanic abound and can be better found elsewhere, it is necessary to relate that Frederick survived the sinking and was one of two trained seamen who were allocated the charge of Lifeboat No.6. Following the sinking, two inquiries were launched; a Senate Inquiry in the United States and a British Wreck Commissioner’s inquiry in Britain (sometimes referred to as the ‘Board of Trade’ inquiry), and Frederick and his lookout colleague – Reginald Lee – appeared as witnesses at both. Sorry you are not with us today. [word illeg.] have awfully busy week. I wanted to tell you about our boy who was saved from the Titanic. I don’t want his name referred to at all, he gave his evidence most creditably before the American Enquiry, but he has still to stand the Board of Trade Enquiry. In next month’s Northern Notes I will refer to the matter but shall not mention Fleet[‘]s name – he has always been an extremely good lad & never failed to keep in touch with me. I got him into the White Star Line 5 or 6 six years ago & I have known from time to time his changes of ship[.] 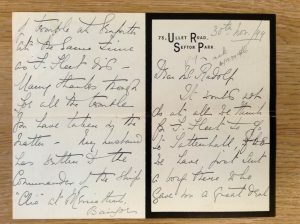 [B]y the P/C [post card] you will see he had no fancy for the Titanic but had to go[.] [H]e was on the Oceanic from March 16th 1908. He is a saving boy & has money put by. Kindly return all the enclosures. Aside from a small press-cutting announcing his death in January 1965, George Killey’s letter is the last item of documentation retained in Frederick Fleet’s case file at The Children’s Society Archive. The specific purpose of this account is to shed some light on Frederick’s early years by drawing on the sources available at The Children’s Society. Consequently it is not necessary to recap the details of Frederick’s life beyond George Killey’s letter above. However, for anyone interested in examining Frederick’s life beyond the events of the Board of Trade inquiry, there are many freely available online sources.